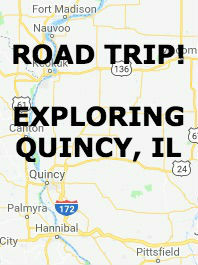 Quincy, Illinois: Exploring "Gem City"
Any drive along the Mississippi River in Illinois should definitely include Quincy, a scenic town that is steeped in history. If you stay in Nebo at Harpole’s Heartland Lodge, you can enjoy a leisurely, scenic drive along the Great River Road north to Quincy. A prime location on the Mississippi, right where Iowa and Illinois meet, made Quincy a transportation hub back in the day. It was a river town but also a railroad town; a place visitors referred to as a “gem of a city” and later, as just Gem City. Once Illinois’ second largest city, Quincy was a key link on the Underground Railroad, and it was here where Lincoln and Douglas held their 6th debate. Quite a history. The past plays an important part in today’s Quincy, and you’ll find more than 3,600 buildings listed on the National Historic Register, as well as four National Historic Districts and three Local Historic Districts. But Quincy has certainly not stood still in time. It’s a progressive town that’s buzzing with artists and merchants, restaurants and brewpubs, museums, and events happening throughout the year. A fun way to explore Quincy is by taking one of their well-designed driving tours. The information is downloadable and includes architecture tours, private home tours, culinary highlights, and Mormon sites. Harpole’s Heartland Lodge is a member of the Illinois Bed and Breakfast Association … a unique lodging experience! This entry was posted in History, Illinois Bed and Breakfasts, Illinois town of interest, Museums, Touring Illinois and tagged History, Illinois B&B's, Illinois towns by admin. Bookmark the permalink.